Continental just rolled out its new “Fare Lock” and it got me thinking about air travel. There used to be a time when you simply bought your ticket and you flew. Maybe you paid a little extra for business or first class but, in general, one fee covered everything. These days, the airlines charge myriad fees-fees for baggage, fees for seats, fees for food, fees for holiday travel, fees for ticket changes, and now fees for locking your fare. Some airlines are even considering fees for simply checking in. Do it online, it’s free, do it at the airport, get ready to pay. During the 1740’s, the average Atlantic crossing took about 1 month by boat, and that’s if the ship left on time, which it usually didn’t. 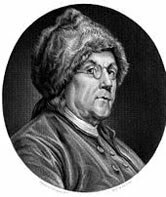 Ben Franklin’s autobiography specifially mentions that ships were often delayed an additional three weeks or more before they made sail. Do you think airline delays are bad these days? Imagine sleeping at the airport for a month before catching your flight. There was also a logistical concern. Most ships connecting the American colonies and Europe landed on the western shores of France. It would’ve taken another handful of weeks, by land or sea, to access the prime hiking trails of Austria, Switzerland, Slovenia and northern Italy. Just for fun, let’s consider that you had an extra six months to spare for round trip travel to the Alps, and you didn’t mind storm-tossed seas, cramped quarters, and spoiled food. If you traveled during the 1770’s, you’d also have to worry about engagement with His Majesty’s Navy. Sure, we have terrorism nowadays, but Franklin had to deal with the awesome firepower of the British Ships of the Line. Imagine enduring a full broadside of heavy cannon during your next voyage to Europe. Anyway, the next time you find yourself with the airline blues, remember one thing. The fact that we can just hop on a plane and go hiking in the Alps is still a pretty sweet deal. In fact, if Ben Franklin were still around, he would probably check a bag.